It’s been 4 years since C189 was adopted and 19 countries have ratified! 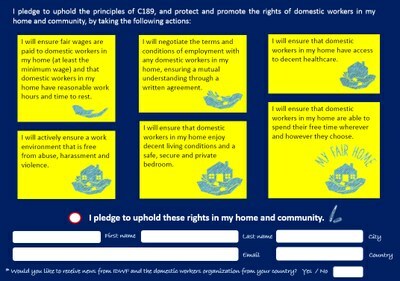 The C189 is a powerful tool to make change in the lives of domestic workers. We have to continue educating, organizing and mobilizing domestic workers in every corner of the world on what it is and how it works for us. Since June 16, 2011, we have not stopped. 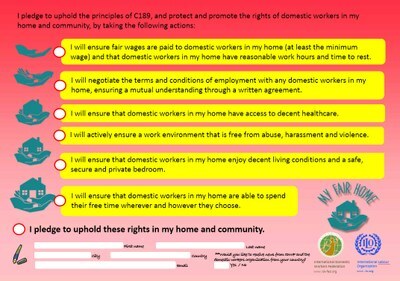 This June 16, we call upon people in our communities, in particular the employers, to hold hands with domestic workers in the "My Fair Home" campaign to ensure dignity and decent work to all domestic workers. Domestic workers do the work that makes all other work possible. It is high time that societies recognize it and value the important contribution of domestic workers. We know there are many people in our communities who believe in this. 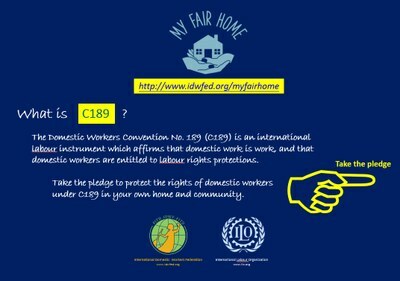 On this June 16, we will begin to walk together, towards achieving "My Fair Home" for every domestic worker and implementation of the C189. Share your actions and lift up a dialogue on social media - post on facebook, and tweet using the hashtag #domesticworkersday and tag @ILO and @IDWFED. 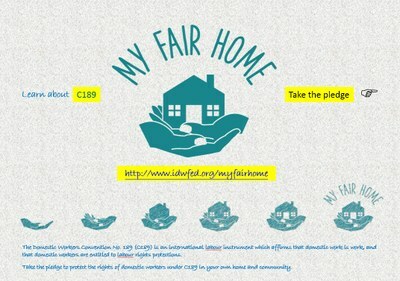 Check out the "My Fair Home" today! in your own home and community?